Have the ignition switch or engine start/stop button in the ON position. Make sure the brake warning light goes off. 2. Fasten the driver's seat belt. 3. Close the driver's door, engine hood and tailgate. 4. Depress the clutch pedal with the gear engaged. 5. Depress the accelerator pedal while releasing the clutch pedal. 4. Depress the accelerator pedal while the shift lever is in R (Rear), D (Drive). With the engine running depress the brake pedal and shift out of P (Park) to R (Rear) or D (Drive). With the engine running depress the brake pedal and shift out of N (Neutral) to R (Rear) or D (Drive). For your safety, you can engage the EPB even though the ignition switch or engine stop/start button is in the OFF position, but you cannot release it. For your safety, depress the brake pedal and release the parking brake manually with the EPB switch when you drive downhill or when backing up the vehicle. A vehicle towing a trailer on a hill or on an incline may slightly roll backwards when starting the vehicle. To prevent the situation follow the below instructions. 1. Depress the clutch pedal and select a gear. 2. Keep pulling up the EPB switch. 3. Depress the accelerator pedal and slowly release the clutch pedal. 4. If the vehicle starts off with enough driving power release the EPB switch. Do not follow the above procedure when driving on a flat level ground. The vehicle may suddenly move forward. 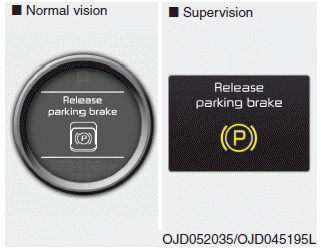 If the parking brake warning light is still on even though the EPB has been released, we recommend that the system be checked by an authorized Kia dealer. Do not drive your vehicle with the EPB applied. It may cause excessive brake pad and brake rotor wear. If you try to drive off depressing the accelerator pedal with the EPB applied, but doesn't release automatically, a warning will sound and a message will appear. If the driver's seat belt is not fastened and any door, the engine hood or tailgate is opened, a warning will sound and a message will appear. If there is a problem with the vehicle, a warning may sound and a message may appear. If the above situation occurs, depress the brake pedal and release EPB by pressing the EPB switch. To prevent unintentional movement when stopped and leaving the vehicle, do not use the shift lever in place of the parking brake. 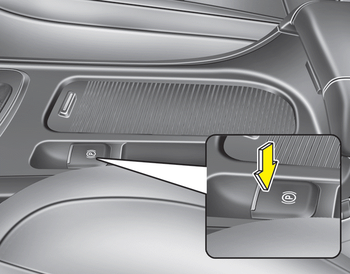 Set the parking brake and make sure the shift lever is securely positioned in P (Park). A click sound may be heard while operating or releasing the EPB, but these conditions are normal and indicate that the EPB is functioning properly. When leaving your keys with a parking lot attendant or valet, make sure to inform him/her how to operate the EPB. The EPB may malfunction if you drive with the EPB applied. When you automatically release EPB by depressing the accelerator pedal, depress it slowly.